A compact, shallow and very chic square wall-mounted ceramic vessel, featuring an integrated bowl with raised edges and an overflow. It also boasts double-fired, kiln dried ceramic construction. It comes predrilled to accommodate your standard, 4 in. off-center faucet, and measures 17.5 in. across, 17.5 in. from back to front, and 4 in. from top to bottom. Coated in a dazzling, stain-resistant white glaze. With an interesting, organic shape and smooth matte finish, the VIGO Peony Matte Stone Vessel Bathroom Sink makes for a unique and durable addition to your bathroom. Constructed from VIGO's trademark ultra-durable Matte Stone PMMA, this sink is guaranteed to be a long-lasting fixture in your home. The delicate curves of the included VIGO Linus Vessel Bathroom Faucet complement the shape of the sink, while the faucet's rich antique rubbed bronze finish creates lovely contrast for an altogether eye-catching set. A matching pop-up drain is also included. Create unexpected texture in your home with the delicate curves and velvety finish of the VIGO Peony Matte Stone Vessel Bathroom Sink. Constructed from VIGO's signature Matte Stone PMMA, this durable sink resists scratches and stains. The seamless, solid-core construction ensures it will never crack. 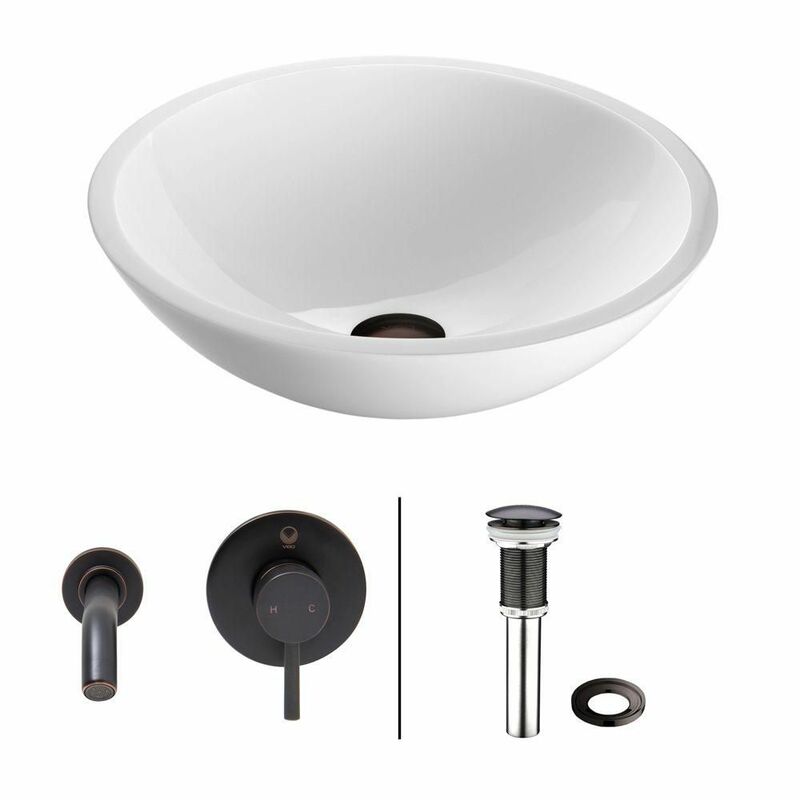 Also included in this set is the sleek, round VIGO Olus Wall Mount Bathroom Faucet in brushed nickel, creating a space-saving solution in your bathroom, plus a matching pop-up drain. Flat Edged Stone Vessel Sink in White Phoenix with Olus Wall-Mount Faucet in Antique Rubbed Bronze is rated 4.5 out of 5 by 2. Rated 5 out of 5 by DHDH from VIGO wall mounted antique bronze faucet This product is beautiful! It’s obvious this company takes pride in their product as the packaging was impeccable. We are truly happy with our purchase. Rated 4 out of 5 by Anonymous from You get what you pay for. I'm using this sink and faucet in my powder room so it doesn't get much use. It looks nice but the quality of the finish on the metal is lacking in places. I exchanged the first faucet because of an unacceptable flaw but the replacement was also flawed in a not as noticeable place. Overall I like it but it would not last for heavy use.